Georgioupolis Hotels, Traditional Villas and Homes - this picturesque, beachside Cretan village is located just 42 km from the capital Chania and sits at the river mouth of the Almyros, in the western Chania Region of Crete. 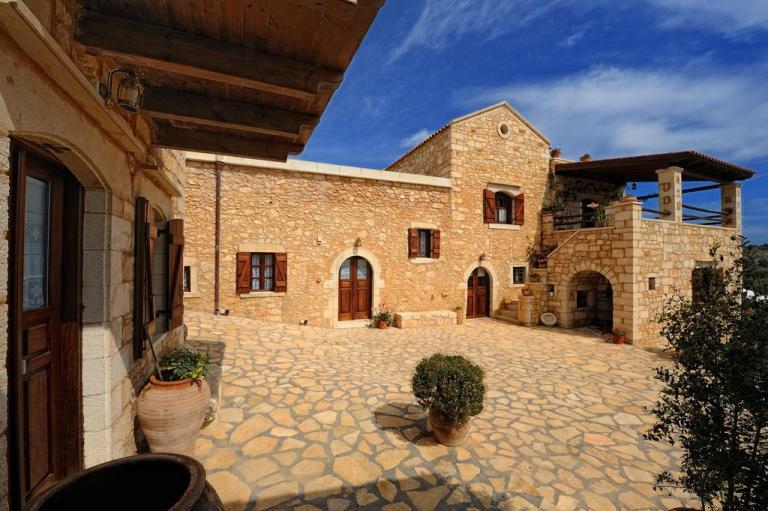 Γεωργιούπολη - reach the village by taxi just 47 km from Chania Airport, avoiding the busy town. Or take a taxi or the bus from Rethymnon town, which is only 22 km to the east. 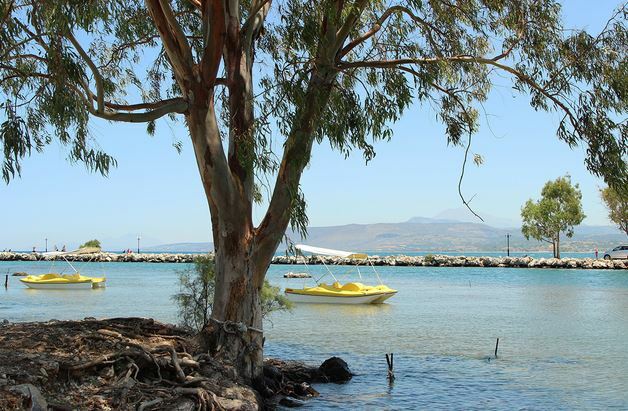 Relax in the tree-lined streets with pretty squares or plateies, the River Almyros and enjoy plenty of tavernas and cafes and a pleasant day-to-day life of the surrounding farming activity which includes grape growing and olive harvesting. Laze and swim at the 9 km long and very wide sandy beach which stretches to the east and gives space for everyone to stretch out and enjoy the clear waters. See the pretty harbour at the mouth of the river, wander across the bridge to the smaller cove of Kalivaki Beach, which has a taverna next to the sand. Walk out to the cutest little chapel in Crete - the simple chapel of Agios Nikolaos sitting at the entrance to the harbour - protecting the fishing fleet. 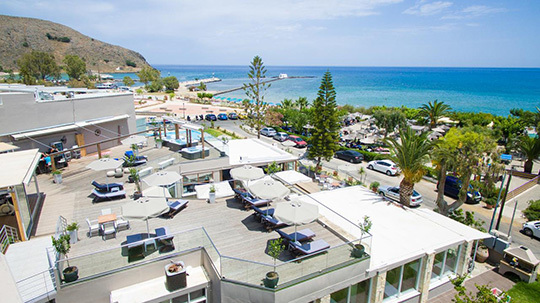 Georgioupolis Beach Hotel - right in the centre of the village across the small road to the beach, with rooftop bar and large pool, affordable accommodation. Gaze across the water to the white chapel surrounded by the blue of the Med. Poseidon Studios - this small budget hotel sits directly on the beachfront just a few km east of the village of Georgioupolis. 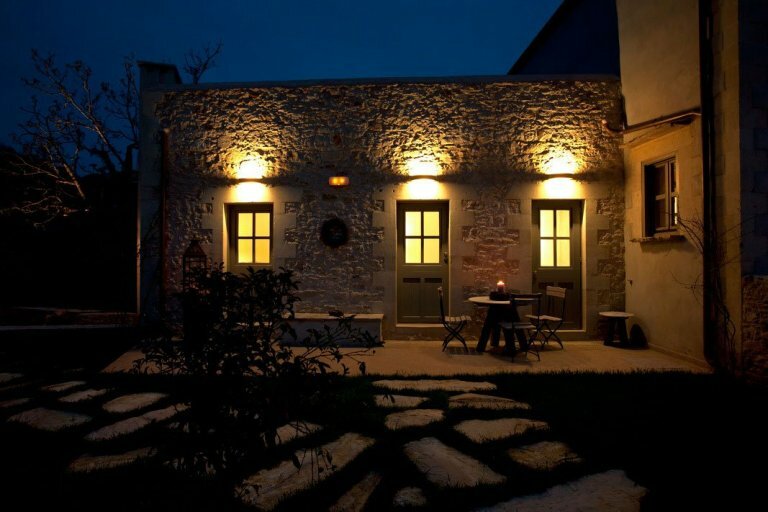 A great choice for the whole family with its own taverna and relaxed atmosphere. Papadakis Apartments in the village are central to everything. 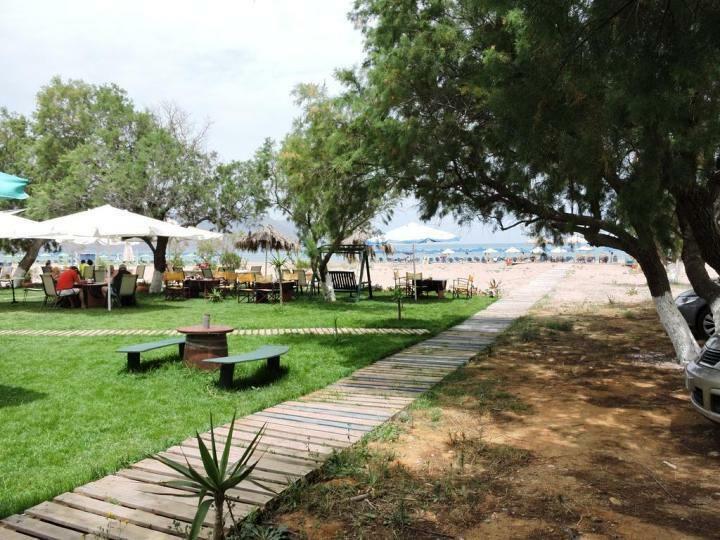 Close to cafes, tavernas, the mini-market and the beach. 600m to the bus stop. Walk to the beach, easy for self-catering here. Blue Fairy Villa - just a little inland enjoy lakeside living at this comfortable villa. 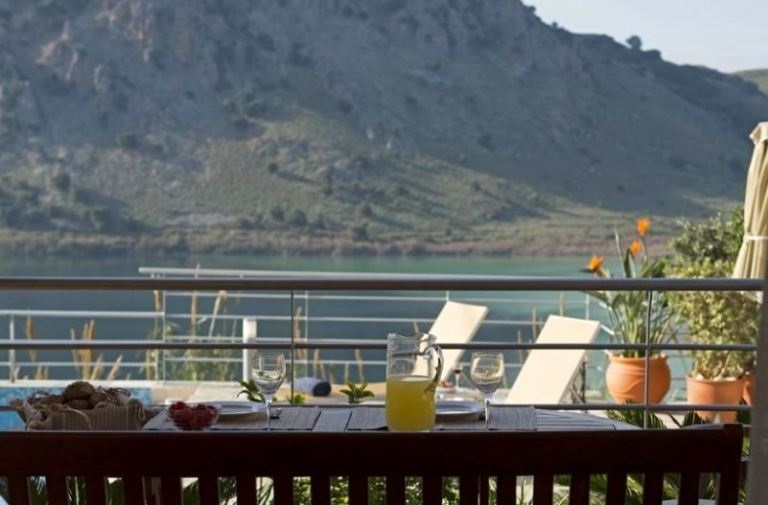 Relax at this lovely position close to Lake Kournas, which is only 4 km from Georgioupolis and 25 km from Rethymnon. 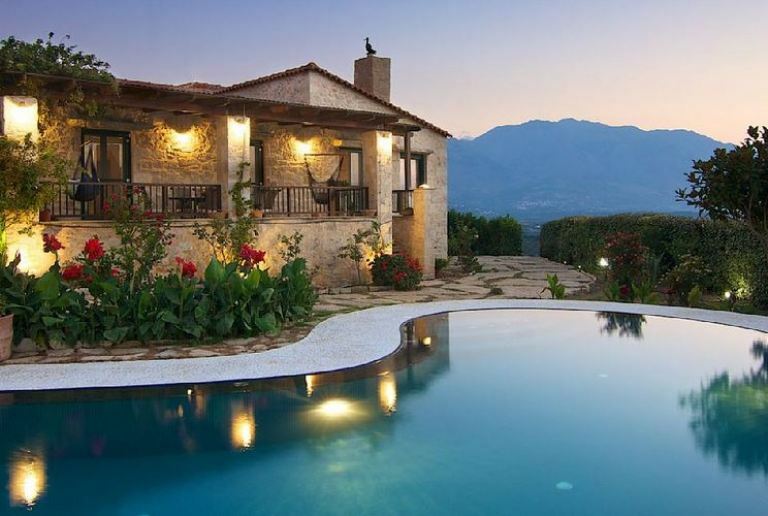 Alexis Villa, located between Georgioupolis and Rethymnon, just outside of the village of Filaki in the hills behind the sea, close to an active traditional village. Welcoming 8 guests in 3 bedrooms and 2 bathrooms with a pool. 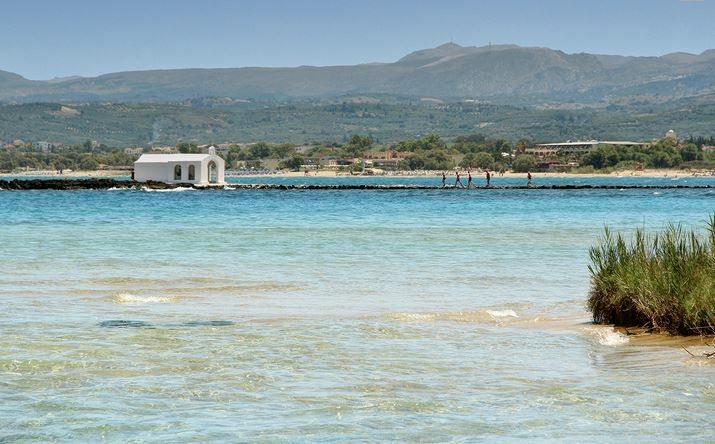 Strofilia Villas are inland from the beach, just 6 km from Georgioupolis village and 30 km from Chania town. This restored 18th century mansion set in a lush green forest amidst verdant hills and silence will sooth any weary soul. Villas welcome 2, 4 or 5 visitors in different parts of the old quarters. 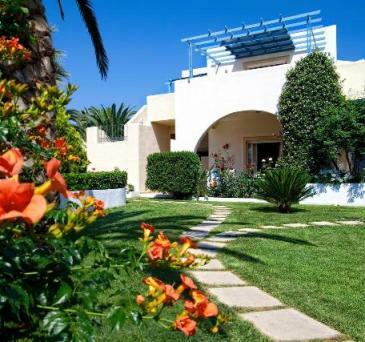 Complete with sumptuous modern conveniences and one villa has a spa. 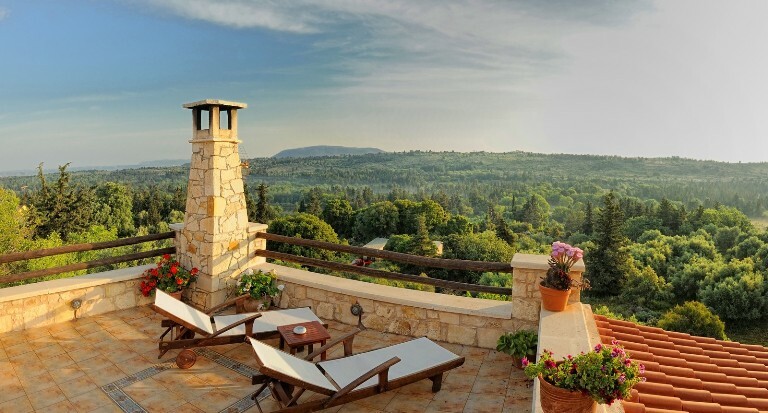 Villa Amanda - located just on the outside of the small village of Maza only 5 km from Georgioupolis Beach, is a beautiful stone-built home in a rural setting. 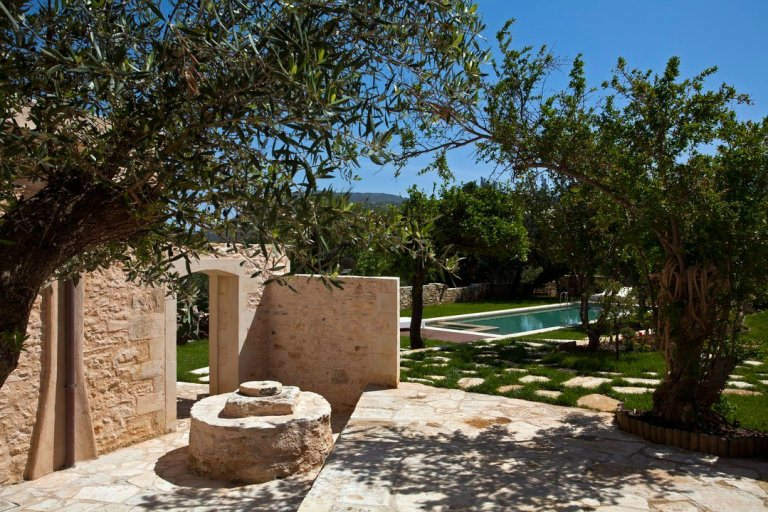 Welcoming 8 guests in traditional yet stylish surroundings with so much space and quiet all around in the olive groves. A must for a relaxing holiday in Crete. Villa Athermigo is close to Georgioupolis Beach yet hidden away in a quiet rural location, outside the hamlet of Agios Pavlos near the village of Gavalohori, 13 km from the beach. A restored heritage oil press, this is a little bit of Cretan history come to life. 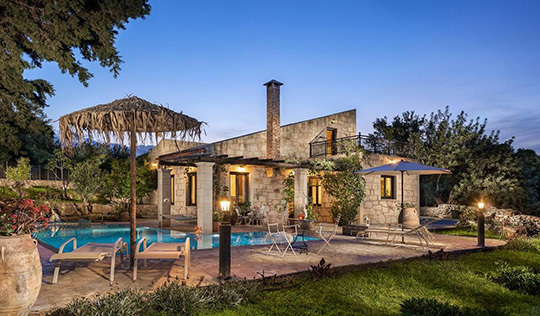 Choose from different villas and studios accommodating 10 or 4 guests, enjoy the real experience of Crete in a farming community. Engagements, commitment ceremonies or other special events can be hosted by the sea in the little chapel of Agios Nikolaos. With plenty of options for your pre and post event accommodation, restaurants and event organisers, this is a very romantic part of Crete to hold your special day. Many of our UK and European visitors fly directly to Chania International Airport, if you are coming from further away, please see our flight pages with options for long-haul flights. Flights from Athens to Chania are frequent and take only 1 hour flying time. Ferries to Chania Port or from Pireaus Port in Athens leave every evening in the summer months with the crossing taking 9 hours. See timetables and booking options below. To get to Georgioupolis from Chania take the national road A90 to the east for 38 km then turn off, the village is 4 km from the turn off. To get to the village from Rethymnon, take the national road west for 18 km then turn off, and the village is another 4 km from the turn off. 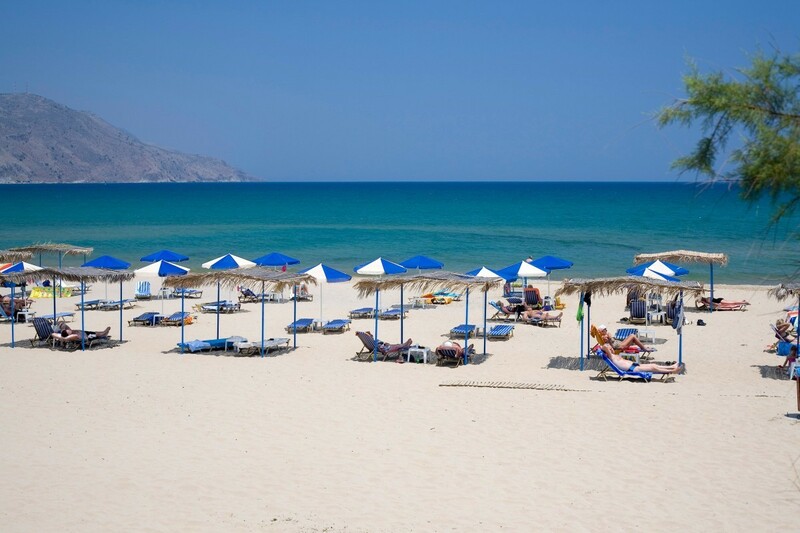 See the location of Georgioupolis village on the north coast of Crete on the map below. West Crete by Bus - our little e-book shows you a 5, 7 or 10 day trip around the west of Crete, including a stay at the beach at Georgioupolis. With handy tips and ideas for getting around Crete on a budget, written by the team at We Love Crete.